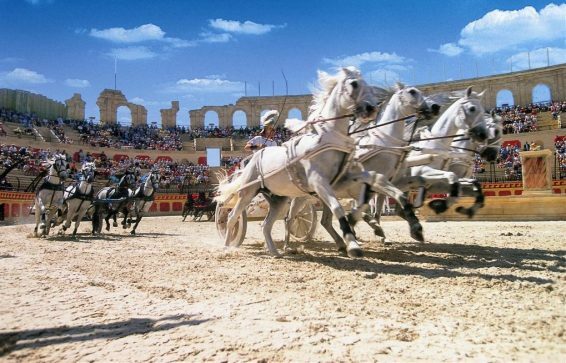 Le Puy du Fou is a historical theme park located 35 km (35 minute journey) from LE CELADON. It is well known outside of France having been elected the “Best Park in the World” several times. Le Puy du Fou’s park covers a hill where a fortress used to stand. It offers an alternative insight into history via incredibly dynamic costumed performances. 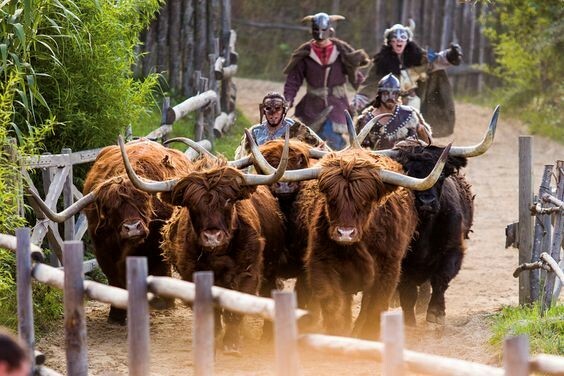 Le Puy du Fou is based entirely on shows. Therefore, you must obtain the times for them for the day of your visit at the entrance to the park or at the site. You can buy your tickets online in advance in order to avoid queues. The park immerses you into four thematic zones that constitute “villages”: the Fortress in Year 1000, the Medieval Town, the 18th century Village and the Town in 1900. “Le Signe du Triomphe“, an incredible performance in a Gallo-Roman Stadium where you will relive the excitement of Circus Games. 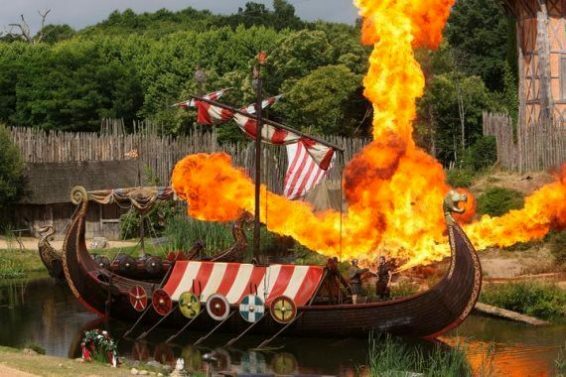 “Les Vikings” a colourful show that portrays an attack on a Fortress in Year 1000 by fierce Vikings emerging from their longships surrounded by gigantic flames. “Le Bal des Oiseaux Fantômes” will amaze you with its 200 birds that skim past your heads with their enormous wings. “Le Secret de la Lance” offers a medieval adventure among the enchanting ramparts of the château in the midst of a battle. “Mousquetaire de Richelieu” transports you back in time for an astonishing swashbuckling show that includes sword fights, flamenco dancing and capering horses. “Les Chevaliers de la Table Ronde“, a superb 15-minute show in armour, brings together the magic of Merlin, a boat, an aquatic surprise, Arthur’s sword and 40 special effects. “Le Dernier Panache” presents the story of Charrette at the time of the French Revolution in a specially built 7,500m² theatre with a basin and 360 degree action. “Le Grand Carillon“, new in 2017, presents swirling performers and acrobats 20 metres above ground striking 70 giant bells. In addition to the performances, on certain days (special ticket and reservation required) the Cinescénie offers a major night-time show that lasts 1 hour and 40 minutes. It is generally organised on Friday and Saturday evenings from June to September. Because of the high demand, it is generally advised to book well in advance (from January). La Cinescénie, a major night-time show portrays the saga of a Vendean family from the Middle Ages through to the 20th century. More than 2,000 volunteers take part in it on a stage covering 23 hectares. Magnificent shows, epic adventures and big thrills for all the family await you at the Puy du Fou.